Working radar is a great way to bring life to your build. Inexpensive and easy to install the rotating radar, HAR360 and HAR362, will gain anyone's attention. You've tried to build one and discovered it ain't so easy. Now, we are offering for the first time anywhere a finished rotating radar as seen on the Ken MacKenzie tugboat. 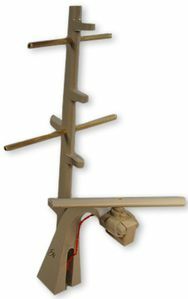 This includes the curved radar support arm, the brass mast and the motor case and radar arm. The key to the unit is an ultra miniature motor that rotates at just the right realistic speed. It is powered by one 1-1/2 volt battery. The battery holder is sold separately. Found below the video. 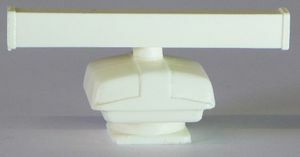 The radar motor case, supporting arm and mast is made of sturdy cast polymer. 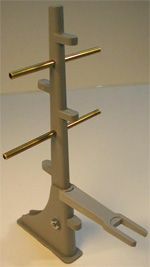 The mast cross arms are brass tubing. Add your selection of light fixtures and you'll be ready to navigate. Total width (including the swing of the radar and the mast outlets): 4-1/8"
Depth (at base, thickest part): 1"
Works nicely for both 1/24 and 1/32 scale boats. Cast polymer base with brass tubing horizontal lighting supports. Depth (at base, thickest part): 2-1/4"
Powered radar unit only. Works nicely for both 1/24 and 1/32 scale boats. For best scale rotation use 1.5 volts. Holds one AA battery (1.5 volts). Use this setup to ensure proper rotation with HAR362 Radar Unit. One AA Battery delivers 1.5 volts. Switch is included with leads. ***Must glue the arm to the head.